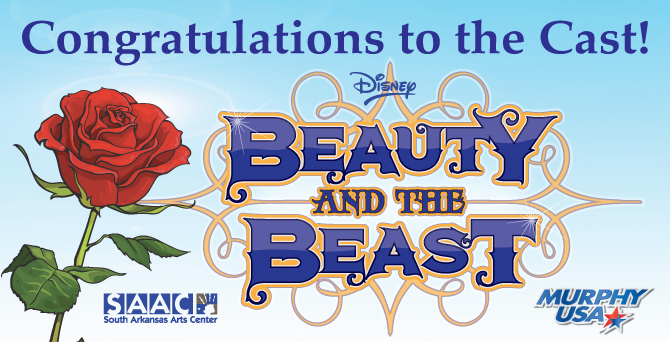 Congratulations to the 75 actors cast in SAAC’s Summer Musical “Disney’s Beauty and the Beast.” It’s a big show and we are very excited to be working with all of you!!! Now for everyone that has been cast in the show, here is a word from the director. Thank you for sharing your time and talents auditioning for our summer production of Beauty and the Beast. The creative team and I appreciate the opportunity to consider you for a role in our production. This was an extremely competitive process; we had a record number of 133 talented people from all over the town and surrounding areas come out to audition. This was definitely a tough decision for us as there were so many talented performers, not to mention our having to look at individual schedule conflicts, character needs, body types, and other factors. • The full cast list is attached. Please check over the full cast list, as chances are you are cast in more than one role. After looking over the cast list, please immediately go to our acceptance site by CLICKING HERE. This must be completed for every cast member whether in the same family or not. All cast members must ACCEPT or REFUSE by Friday, April 14th. Failure to do so will result in your role(s) being recast. • All understudies will have their own rehearsal and their own performance. • Please review over all rehearsal schedules and mark your calendar. Only conflicts listed on audition form will be accepted. • We invite all kids to also participate in our summer camp, “The Enchantment of Beauty & The Beast”, Monday – Friday, June 12-16. This camp includes training in acting, dance, and voice. For more information please visit us online at www.saac-arts.org. • Mark your calendar for our cast production meeting Saturday, May 20th at 10am. All cast members and one parent of each child cast member must be present. • I will be sending your production area for work day after all acceptance/refusals are in. • If you don’t see your name in at least two places please email me. With a cast this size, I am sure there may be some boo boos even after checking it three times. • If you did not receive a text from me this last weekend, please subscribe to messages by texting @batbshow to (832) 632-8029. It’s free! If you have questions, please email me at thebbpac@gmail.com. We appreciate you taking your time out to share your talents with the SAAC community. We are extremely excited about this production. Important LINKS: After reading the letter from the director, follow this link to the acceptance site to accept your role.